Have you seen the latest KFC ads where they promise a free chocolate-chip cake with any bucket of chicken? I'd seen them, but I hadn't paid much attention to them. Which is why, when I was at Kentucky Fried Chicken picking up supper, I was totally taken by surprise when the kid behind the counter asked, "Would you like a free cake with that?" Why thank you, young man, I would indeed enjoy a complimentary baked good. 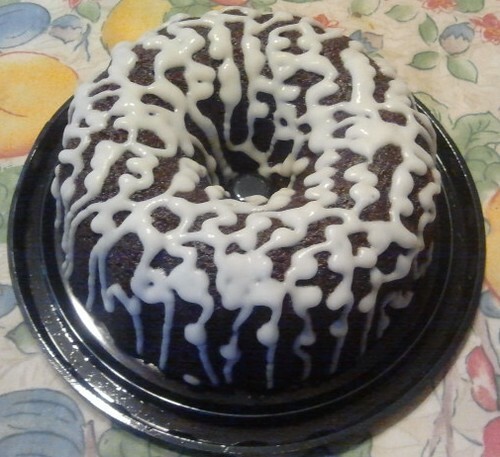 The cake is a very moist, almost fudgy, chocolate ring cake drizzled with white confectioner's frosting. It's very good, though a little light on the chocolate chips. If you happen to be in the mood for KFC and you're offered the cake, take it. But seriously, this is probably one of the best things ever to be served. I've never had a cake so moist; that little sucker is just amazing! The problem with the cake is the nutritional facts, its made with some form of animal fat. It is delicious but clearly deadly. I Want Me Some Crapes. Or Maybe A Tortia. Wait - What The Hell Is "Flaming Young?"